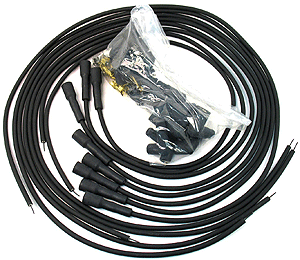 Universal high performance plug lead set, for the 1932-53 flathead V8 engine. with straight spark plug ends. together with state of the art performance from Pertronix. The core consists of a carbon-impregnated fiberglass center that is spiral-wound with stainless steel alloy. Low 500 ohm per foot resistance, silicone jackets to resist high temperatures. The perfect addition when using electronic distributors.